Anna found CalAgrAbility through the Department of Rehabilitation (DOR) website. 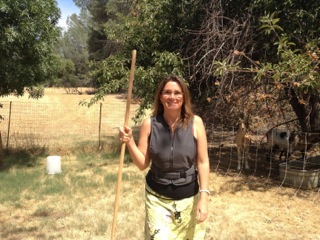 Anna and her husband work at their organic farm in the Capay Valley, where they farm multiple crops year-round. Diagnosed with Multiple Sclerosis (MS), a disease that interrupts the nerve impulses from the brain to the spinal cord, Anna found herself unable to perform physical, outside farm work in the heat. As a result, she switched to human resource tasks at their farm office. Although she was working indoors, the scorching summer heat still seeped indoors creating unsafe working conditions for Anna. Worried that her physical limitations would cause problems for her performance and the business, Anna sought out a way to continue doing what she loves to do. When CalAgrAbility received a call from Anna in 2014, it was clear that she had the hard work ethic and pride that characterizes the agricultural community. While she had seen assistive technology (AT) at an MS education event, Anna was hesitant on trying a cooling vest due to its high cost and her concern of how this would affect her everyday interactions. With the encouragement of CalAgrAbility, Anna started trying necessary work modifications for her health. CalAgrAbility, DOR, and Anna worked together to obtain the AT needed, a cooling vest and an AC unit. The cooling vest allowed her to continue working outdoors at the farm. DOR was able to finance an AC unit that was installed in her farm office to help her work efficiently and safely indoors.